The future of hydroelectricity: It’s not good. Hydroelectricity is getting less reliable due to global warming. And the world is doubling down on it. At the Hoover Dam, new hydropower turbines are being installed at a lower elevation to prepare for future shortages in the Colorado River—but even that’s just buying time. Huge dams fitted with hydroelectric power plants may seem very 20th century. Their basic technology—falling water turning a paddle wheel—hasn’t changed much in thousands of years. But hydropower is by far the world’s No. 1 renewable energy resource, and it’s going to stay that way for quite some time, despite growing questions surrounding its reliability. “In a world in which the climate is changing, the value of hydro becomes more uncertain,” says Peter Gleick of the Oakland, California–based Pacific Institute. “We know that one of the worst impacts of climate change will be impacts on water—on droughts, on floods, on demand [via increased evaporation].” You can add energy to that list. Coupled with advances in turbine efficiency and the installation of new generating capacity at existing dams, hydropower generation in the U.S. has held steady over the past decade. Because of the drought and global warming writ large, that’s not a guarantee for the future. 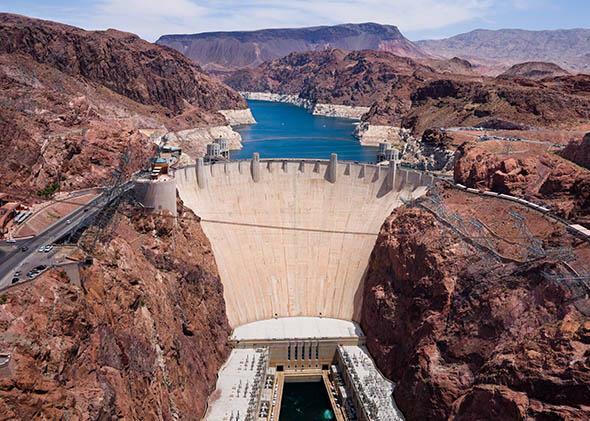 An example: At the huge Hoover Dam, where Lake Mead is now at record low levels due to a multiyear drought, new hydropower turbines are being installed at a lower elevation to prepare for future shortages in the Colorado River—but even that’s just buying time. Still, the U.S. Department of Energy is currently constructing a broad blueprint to “usher in a new era of growth in sustainable domestic hydropower over the next half century” despite the economic and environmental uncertainties. The U.S. isn’t alone in its quest for more hydro. The World Bank, which funds large development projects like dam construction in poor countries, acknowledges that hydropower is an increasingly risky bet for energy generation but has decided to move ahead anyway. Hydropower is especially appealing to governments right now because of their desire to quickly meet low carbon energy generation targets—and foreign governments, mainly China, are happy to build them, often with relaxed social and environmental standards. That brings fat paychecks for Chinese companies and the chance to earn political favor worldwide. That strategy is part of a “global boom” in hydropower generation expected in the next two decades—an estimated 3,700 major dams are either planned or under construction worldwide right now. But there’s one controversial project that’s even too risky for the World Bank. The Grand Ethiopian Renaissance Dam, once completed in 2017 with the help of Chinese investment, will be Africa’s largest hydropower generating facility and will triple Ethiopia’s electricity supply, turning Ethiopia into a net power exporter. Ethiopia needs the electricity, but independent analysis—and decades of history—shows that the new dam will only make the quick growing country more vulnerable to future climate shifts. Of the 17 countries that derive more than 90 percent of their electricity from hydropower, 14 of them rank among the poorest in the world. Take for example Latin America, arguably the region that’s currently most dependent on hydroelectricity. In the rapidly melting Andes, hydropower generation is getting more “peaky,” with more meltwater coming in the spring and less in the summer. Brazil’s huge Amazon River basin currently supplies about 70 percent of the country’s power, but an ongoing intense drought—the worst in the country’s history—has resulted in rolling blackouts nationwide, with, you guessed it, an increased reliance on coal and natural gas to fill the short-term gaps. Despite this, the country wants to build more dams. The U.S. Pacific Northwest looks a lot like Latin America in terms of its energy mix. Washington state, which gets 69 percent of its energy from hydropower—mostly from the huge Grand Coulee Dam—just declared a drought emergency and for this reason is likely to have more problems with future energy shortages than California, according to Gleick. Across the West, nearly half of all power plants are expected to see a decrease in electricity generation due to climate swings in the future. Even countries that aren’t as reliant on hydropower are still vulnerable to climate swings. India gets only about 20 percent of its electricity from dams, but a 2012 blackout there—the worst blackout in world history—cut power to an estimated 670 million people, nearly as many people as live in the United States and Western Europe combined. It was blamed, in part, on low rainfall during a poor monsoon season and a lack of water to conventional coal and nuclear power plants, which rely on a continuous supply of water to boil in order to turn their steam turbines. To California’s credit, amid the ongoing drought the state has been able to diversify its energy mix away from hydro. The rest of the country is slowly starting to do the same thing. For the U.S. as a whole, 2014 was the first year in history in which nonhydro renewable energy outproduced energy coming from dams.